I made another new friend through the mail, Kathleen. She penned a sweet note on classic letter writing paper (so lovely and woefully underused if you ask me). Best of all, she asked some thoughtful questions which made writing her back all the more fun. Thanks so much for your note (on gorgeous Crane + Co. stationery no less–swoon). You really must tell me more about this “living overseas as a child” bit–it sounds utterly glamourous! Letters from across oceans always seem extra special! How recently were you married? 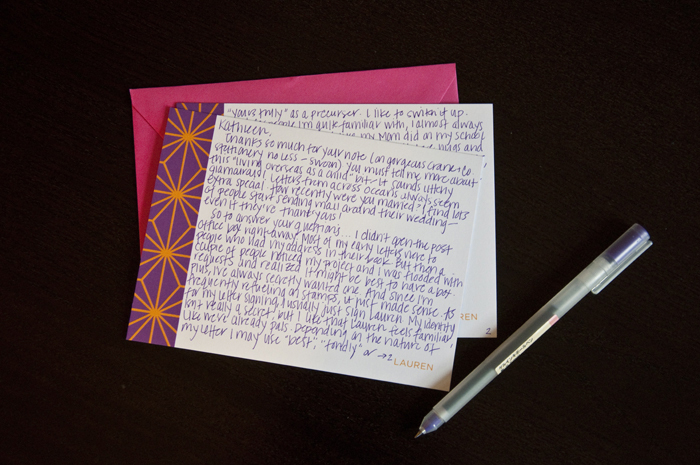 I find lots of people start sending mail around their wedding–even if they’re thank yous! So to answer your questions… I didn’t open the post office box right away. Most of my early letters were to people who had my address in their book. But then a couple of people noticed my project and I was flooded with requests and realized it might be best to have a box. Plus, I have always secretly wanted one. And since I’m frequently re-fueling on stamps, it just made sense. As for my letter signing, I usually just sign Lauren. My identity isn’t really a secret, but I like that Lauren feels familiar, like we’re already pals. Depending on the nature of the letter I may use “best”, “fondly” or “yours truly” as a precursor. I like to switch it up. And for people I’m quite familiar with, I almost always include x’s and o’s–just like my Mom did on my school lunchbox napkins. Because who doesn’t love hugs and kisses by mail? I am always fascinated by sign-offs, especially now then most people do all their letter-writing via email. Thank goodness for fellow letter and paper lovers like you! Thanks again for your sweet note and for reading. It means the world!